Subtitle: Rebecca Sexton and several people of Former Catholics For Christ viewed "The Passion" twice and discovered that, not only is the movie solidly Traditional Catholic, it also seems clearly designed to call former Catholics back to the Roman Fold! As a former Catholic, I resisted going to see Mel Gibsons movie The Passion of Christ, knowing Mel is a devout Catholic. I would never trust, depend or look to Hollywood for doctrinal instruction. However, with such Christians as Billy Graham, Chuck Colson, Dr. James Dobson, Pat Robertson, and organizations such as the 700 Club, TBN, Campus Crusaders for Christ, etc., as well as many area preachers praising this film as theologically accurate and the newest, hottest evangelizing tool ever, I felt compelled to go see the movie. Watching this movie as a former Catholic I quickly saw that unless one has been initiated into the Cult of Catholicism, or well-read in its doctrines, that person probably wont recognize all the symbolism and false doctrine cleverly hidden within "The Passion of Christ". I saw the sorrowful mysteries of the rosary, the scapular (a brown cloth that comes with a special promise to those who wear it...In the movie, the repentant thief has a crude version of it), the Stations of the Cross, a chalice instead of the Biblical cup, St Veronica, clothing that looked much like a nuns habit, and of course, the Eucharistic imagery. How anyone can say this movie is theologically accurate is beyond me. They are either ignorant of scripture or never believed it to begin with! Be assured that this movie does NOT depict the gospel accurately according to Matthew, Mark, Luke and John! Events that did take place are omitted, and things that never happened were added. Not only does Mel take lightly the warnings to those who add to or take from the word of God, but so do those who endorse this movie! Did you notice, that Dr. Dobson? Those who "add to" the Biblical account are liars! So, too, are those Evangelical Christian leaders, mentioned above, who solemnly swore publicly that "The Passion" was faithful to the Biblical account. Dr. Dobson even goes so far as to say that this movie does not depict any "unique Catholic doctrine". UNSCRIPTURAL EVENTS IN "THE PASSION"
In the movie, Jesus falls at least 8 times on His way to Calvary. Where is this in the scripture? In the movie, they beat and kicked Jesus the whole way to Calvary. Where is this in the scripture? In the movie, Jesus was tempted by Satan in the garden. Where is this in the scripture? In the movie, they flayed every inch of the body of Jesus, well beyond that which the law allowed (Deut.25:3, 2 Cor.11:24) or any human could endure. Where is this in the scripture? This movie seemed to depict what Satan would have liked to have done to Jesus, not what actually happened to Him. I often felt like Satan was using Mel to express his great hatred of the one true Biblical Jesus. One thing I know for sure, Mel Gibsons movie presents another gospel and another Jesus. Where did all these extra-biblical events of the movie originate, anyway? According to an interview I watched on television, Mel contemplated committing suicide. He says all the things Hollywood offered him left him empty. Subsequently, he read a book by a demon possessed Catholic mystic and visionary, St. Anne Catherine Emmerich (1774-1824), an Augustinian nun at the Convent of Agnetenberg, Dulmen, Westphalia, Germany, who suffered from the stigmata (one who displays the wounds of Christ). Emmerich detailed visions of the passion of Christ, as documented in her book, The Dolorous Passion of Our Lord Jesus Christ, (Nihil Obstat: Georgius D. Smith. D.D. Censor Deputatus Imprimatur: EDM. CAN. Surmont Vicarius Generalis Westmonasterii, Die XXI MAII MCMXXVIII). After reading her book, Mel decided to make a movie of the passion of Christ. He said he did it for a penance for even contemplating suicide. It must be nice to make millions on your penance, Mel! Are you getting rich on this, or is the Catholic church getting more filthy rich? The bottom line is this: When you watch this movie, whatever event cannot be found in the Bible, can be found in the mystic Emmerich's book, an account that provides much greater detail. This event never happened in the scriptures. Jesus was not afraid in the Gospels! To understand theologically what was happening to Jesus in the Garden, read NEWS1896. Simply put, Jesus came under such agony because God had begun the process of shifting all the sins of the world onto Him, and because Jesus knew that God would have to temporarily turn His face away from Jesus, thus causing the first-ever separation from God the Father and Jesus the Son. However, in her book, Emmerich details concocted temptations and accusations hurled at Jesus in the garden by Satan, which goes beyond the ridiculous and causes Jesus to writhe like a worm beneath the weight of his anguish and sufferings! (The Dolorous Passion of Our Lord Jesus Christ, 102) Again, this is taken from Emmerichs book. John said to him: Master, what has befallen thee? Must I call the other disciples?...Call not the eight; I did not bring them hither, because they could not see me thus agonising without being scandalized; they would yield to temptation, forget much of the past, and lose their confidence in me. But you, who have seen the Son of Man transfigured, may also see him under a cloud, and in dereliction of spirit; nevertheless, watch and pray, lest ye fall into temptation, for the spirit indeed is willing, but the flesh is weak (Ibid., 103). Did you catch that infamous blasphemy against Jesus? Emmerich reported Jesus saying He did not want His disciples to see Him in "dereliction of spirit"! . (Funk and Wagnalls College Dictionary) A derelict is one who is unfaithful or neglectful of obligation. Its evident that the spirit who was revealing the passions of Christ to Catherine Emmerich was NOT a Godly Spirit. Jesus NEVER failed in duty, nor was He EVER neglectful. This is rank blasphemy! Amid all these apparitions, Satan held a conspicuous place, under various forms, which represented different species of sins. Sometimes he appeared under the form of a gigantic black figure, sometimes under those of a tiger, a fox, a wolf, a dragon, or a serpent. Not, however, that he really took any of these shapes, but merely some one of their characteristics, joined with other hideous forms. None of these frightful apparitions entirely resembled any creature, but were symbols of abomination, discord, contradiction, and sinin one word, were demoniacal to the fullest extent. These diabolical figures urged on, dragged, and tore to pieces, before the very eyes of Jesus, countless numbers of those men for whose redemption he was entering upon the painful way of the Cross. At first I but seldom saw the serpent; soon, however, it made its appearance, with a crown upon its head. This odious reptile was of gigantic size, apparently possessed of unbounded strength, and led forward countless legions of the enemies of Jesus in every age and of every nation. Being armed with all kinds of destructive weapons, they sometimes tore one another in pieces, and then renewed their attacks upon our Saviour with redoubled rage. It was indeed an awful sight; for they heaped upon him the most fearful outrages, cursing, striking, wounding, and tearing him in pieces. Their weapons, swords, and spears flew about in the air, crossing and recrossing continually in all directions, like the flails of threshers in an immense barn; and the rage of each of these fiends seemed exclusively directed against Jesusthat grain of heavenly wheat descended to the earth to die there, in order to feed men eternally with the Bread of Life. Thus exposed to the fury of these hellish bands, some of which appeared to me wholly composed of blind men, Jesus was as much wounded and bruised as if their blows had been real. I saw him stagger from side to side, sometimes raising himself up, and sometimes falling again, while the serpent, in the midst of the crowds whom it was unceasingly leading forward against Jesus, struck the ground with its tail, and tore to pieces or swallowed all whom it thus knocked to the ground. It was made known to me that these apparitions were all those persons who in divers ways insult and outrage Jesus, really and truly present in the Holy Sacrament. I recognised among them all those who in any way profane the Blessed Eucharist. I beheld with horror all the outrages thus offered to our Lord, whether by neglect, irreverence, and omission of what was due to him; by open contempt, abuse, and the most awful sacrileges; by the worship of worldly idols; by spiritual darkness and false knowledge; or, finally, by error, incredulity, fanaticism, hatred, and open persecution. Among these men I saw many who were blind, paralysed, deaf, and dumb, and even children;blind men who would not see the truth; paralytic men who would not advance, according to its directions, on the road leading to eternal life; deaf men who refused to listen to its warnings and threats; dumb men who would never use their voices in its defence; and, finally, children who were led astray by following parents and teachers filled with the love of the world and forgetfulness of God, who were fed on earthly luxuries, drunk with false wisdom, and loathing all that pertained to religion. Among the latter, the sight of whom grieved me especially, because Jesus so loved children, I saw many irreverent, ill-behaved acolytes, who did not honour our Lord in the holy ceremonies in which they took a part. I beheld with terror that many priests, some of whom even fancied themselves full of faith and piety, also outraged Jesus in the Adorable Sacrament. I saw many who believed and taught the doctrine of the Real Presence, but did not sufficiently take it to heart, for they forgot and neglected the palace, throne, and seat of the Living God; that is to say, the church, the altar, the tabernacle, the chalice, the monstrance, the vases and ornaments; in one word, all that is used in his worship, or to adorn his house...I could never detail all the insults offered to Jesus in the Adorable Sacrament which were made known to me in this way. I saw their authors assault Jesus in bands, and strike him with different arms, corresponding to their various offences. I saw irreverent Christians of all ages, careless or sacrilegious priests, crowds of tepid and unworthy communicants, wicked soldiers profaning the sacred vessels, and servants of the devil making use of the Holy Eucharist in the frightful mysteries of hellish worship. Among these bands I saw a great number of theologians, who had been drawn into heresy by their sins, attacking Jesus in the Holy Sacrament of his Church, and snatching out of his Heart, by their seductive words and promises, a number of souls for whom he had shed his blood. Ah! it was indeed an awful sight, for I Saw the Church as the body of Christ; and all these bands of men, who were separating themselves from the Church, mangled and tore off whole pieces of his living flesh. Alas! he looked at them in the most touching manner, and lamented that they should thus cause their own eternal loss. (The Dolorous Passion of Our Lord Jesus Christ, pp.112-113; Emphasis added). How theologically accurate is this? Here we have Jesus suffering because we Christians have rejected the Real Presence in the Catholic Eucharist and refuse to worship it -- according to Emmerich. Where in Scripture does it tell us to worship a piece of bread in the Adorable Sacrament? Not only will you not find the word sacrament in the Bible, but God is clear that He does not dwell in temples made by mans hands! Howbeit the most High dwelleth not in temples made with hands; as saith the prophet (Acts 7:48). Keep in mind that the same demons who revealed to Emmerich all the extra beatings, kickings, flaying of skin done to Jesus (which youll see in the movie) also say you should adore the blasphemist Eucharist and worship at the Catholic Church. Are you beginning to see the problem here with saying that this movie is acceptable or theologically accurate? Do you see the problem that comes from allowing even one thing to be added to Gods word? It opens the door for other things to be added that are not found in the Bible. We dare not! But, Mel Gibson did! Mel wants to present the world with his "mother", and that he did! Veronica -- Invented "Station of the Cross"
In the movie, a young woman goes up to Jesus and takes her veil off and hands it to Jesus. The average Christian will think nothing of this, but the Catholic knew exactly what Mel was depicting. The woman is St. Veronica who supposedly was so moved by pity at witnessing Jesus struggling with his cross toward Golgotha that she wiped his face with her veil. Jesus rewarded her kindness by leaving his face print on the veil. This image is actually a painted portrait that arose during the fourteenth century. It comes from the Latin, vera icona, "true images", which was corrupted to "St. Veronica" and so gave rise to the pious legend! VERONICA, SAINT. According to tradition, the woman who is said to have wiped the face of Christ while he carried his cross to Calvary, was called Veronica. The same name is sometimes given to the woman whom our Lord cured (the event is described in chapter 5 of St. Mark's Gospel). IN NEITHER CASE IS THE TRADITION SUPPORTED BY HISTORICAL EVIDENCE, and neither is mentioned in the Roman Martyrology or list of saints (Emphasis mine). The Holy Face or Veronica: The veil with which (according to a tradition which forms the subject of the Sixth Station of the Cross) a pious woman wiped the face of Jesus on his way to Calvary, and on which remained the imprint of his suffering face. It is kept in St. Peter's and is the third of the great relics. It is publicly venerated on the last four days in Holy Week, on Easter Sunday, and on the occasion of the closing of the Holy Door in jubilee years. The name Veronica may be a combination of Latin vera (true) and Greek eikon (picture), and then have been mistakenly thought to be the name of the woman whose veil it was. There is another Veronica in the Lateran Basilica; IT IS IMPOSSIBLE TO DETERMINE WHICH, IF EITHER, OF THESE TWO RELICS IS AUTHENTIC. There are many replicas in existence. St. Teresa of Lisieux is often portrayed with a veil of Veronica because she had a great devotion to the Holy Face and added and of the Holy Face to her name of Teresa of the Infant Jesus" (Emphasis mine). 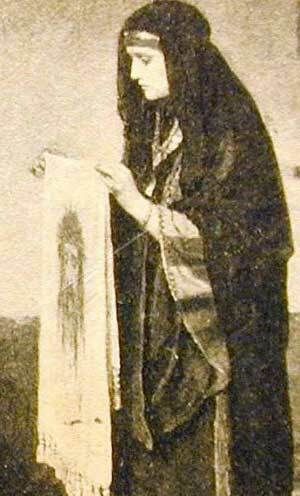 My tender Jesus, Who didst deign to print Thy sacred face upon the cloth with which Veronica wiped the sweat from off Thy brow, print in my soul deep, I pray Thee, the lasting memory of Thy bitter pains. Our Father...Hail Mary...Glory be to the Father..."
Imagine teaching children to pray to "Jesus" about something that was a blatant historical lie! Below, you will see that the lie of Veronica giving her cloth to Jesus is Station Number Six! Yet, in idolatrous Roman Catholic shrines all over the world, these 14 Stations of the Cross are erected and the faithful are required to pray before each one! It is the Roman Catholic practice during Lent to dwell on the sufferings of Christ and meditate on them through the 14 Stations of the Cross. These 14 stations of the cross are supposed to recall the most prominent events that took place as our Lord traveled to Calvary. Out of fourteen stations of the cross, five of them are out-and-=out lies, and two of them are out of context, and Mel depended on them all in his movie except the eighth station. Second Station: Jesus carries his cross. Third Station: Jesus falls the first time. Fourth Station: Jesus meets his afflicted mother. Fifth Station: Simon of Cyrene helps Jesus to carry his cross. Seventh Station: Jesus falls the second time. Eighth Station: The daughters of Jerusalem weep over Jesus. Ninth Station: Jesus falls the third time. Fourteenth Station: Jesus is buried in the tomb (Outlines of the Catholic Faith, Nihil Obstat: George J. Ziskovsky, Censor Deputatus, Imprimatur: John R. Roach, D.D. Archbishop of St. Paul and Minneapolis, 1980). Mel didnt mind adding things that are not scriptural, but why did he omit the things that are in Scripture? For example, the Eighth Station of the cross is the daughters of Jerusalem weeping over Jesus". Did Mel omit this Station because Jesus says, weep not for me, but weep for yourselves? Mel made sure that all Romes key doctrines and imagery of the Eucharist were reaffirmed in this movie. Catholics teach that Jesus instituted the Catholic Mass at the Last Supper. Thus, when you see the bread unwrapped, the camera flashes to a scene of Jesus being stripped. When Jesus' blood was dripping from the cross, the camera flashes to wine being poured into a chalice at the Last Supper. When accusations are being hurled at Jesus at his trial, John 6 is quoted by an irate Jew saying that Jesus said men had to eat his body and drink his blood for eternal life. Of course there is no record that this accusation was made during the trial, but it sure has strong imagery for the Catholic or former Catholic! Identical yet different? Bloody but Unbloody. Does anyone see a contradiction in terms here? . (#1395) How then is the Mass identical to the sacrifice of the cross? 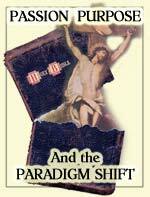 If it cannot take away all the sins of the world, as the Catechism says, what good is it? Romes insistence that the Mass is identical to Calvary falls in light of their own writings. Dont look for reason or logic in Catholicism. You wont find it. "The Passion" Also Faithfully Depicts The "Five Sorrowful Mysteries of the Rosary"
Therefore, you can see how very, very Roman Catholic this movie truly is, the false assurances of Dr. James Dobson notwithstanding! "By the will of God, the most Blessed Virgin Mary was INSEPARABLY JOINED WITH CHRIST IN ACCOMPLISHING THE WORK OF MANS REDEMPTION so that our salvation flows from the love of Jesus Christ and His sufferings, intimately UNITED with the love and sorrows of His Mother" (1956 Encyclical, Devotion to the Sacred Heart of Jesus). .shame on you Dr. James Dobson...shame on anyone who condones this movie as theologically accurate! You have put a stumbling block before the unsaved Catholic! Mel had several Jesuits helping him behind the scenes of the making of this movie. I cannot judge whether Mel is ignorant of Jesuit tactics, but Jesuits are masters at brainwashing. With the loss of so many members because of pedophilia scandals in the priesthood, the releasing of the movie during Lent seems more than just a coincidence. Since the Jesuits believed that if they could teach the youth they would belong to them forever, could it be that they are hoping to win all of us back to the fold? And just think...the Jesuits have the endorsement of top Evangelicals and Protestant leaders to confirm the accuracy of this movie. It sickens me. The Jesuits regard the education of the young as the most important means of achieving their aim to brainwash. ...for thus could the mind, reason and imagination of innumerable young people, from their first inclination towards independent thought and emotion up to full maturity, be permanently and systematically influenced in the best and most effective manner (The Power and Secret of the Jesuits, Rene Fulop-Miller, 404-405). Impressionable young children seeing this movie could well be seduced later in life to embrace the Mary of Roman Catholicism, especially in light of the positive reviews by so-called Protestant Christians. The Jesuits love this kind of publicity. It will strengthen their position at just the right time in history! I know the tactics of the Jesuits, being a victim of their techniques myself. From the moment I entered St. Pauls Catholic grade school, I was indoctrinated into the Cult of Mary. I would be taught daily prayers to Mary (morning, twice at noon and at the end of the school day). I would be taught songs that glorified Mary and learn the use of rosaries, scapulars, candles, incense and image worship. I can honestly say that I was saturated with Mary worship. The pedagogic method of the Company [Jesuits] consists first of all of surrounding the pupils with a great network of prayers...Let us not be anxious as to where and how mysticism is inserted into education!...It is not done through a system or artificial technique, but by infiltration, by endosmosis. The childrens souls are impregnated because of their being in close contact with masters who are literally saturated with it...At the front - it is characteristic of this Order - we find the Virgin Mary. Loyola had made the Virgin the most important thing in his life. The Worship of Mary was the base of his religious devotions and was handed down by him to his Order. This worship developed so much that it was often said, and with good reason, that it was the Jesuits real religion (The Secret History of the Jesuits, Paris, 59). From the chanting of Ave (which triggers the Catholics mind to Maria), to the repeated scenes of Mary being the strength that keeps Jesus going, the Passion of Christ is a Marian movie. It was meant to trigger the brainwashing we had as children back to the worship of Mary and back into the fold of the Catholic church. Holy Spirit Is NOT The Promised "Helper" In Roman Catholicism! Poor Protestants and Baptists! You saw Jesus promise a "Helper" and comfortably believed this line was Scriptural! You really thought that "Jesus" was speaking of the Holy Spirit. Little did you know that Roman Catholic theologians have cleverly redefined who the "Helper" really is! This "another Jesus" was promising his disciples that God the Father was going to send Mary to help them! What unbelievably clever deception. Since we know from Dr. Cathy Burns' book, "Focus On The Family -- Little Known Facts" that Dr. Dobson has been misleading his people for many, many years on so many different subjects, and since we have in our bookcase a book written by a Vice-President of Focus on the Family entitled, "Finding God In Lord of the Rings", we can now safely say that Dr. Dobson is a "wolf in sheep's clothing"! Catholics also teach that Mary is the sign of hope and help till Christ returns. ...Likewise she shines forth on earth, until the day of the Lord shall come, a sign of certain hope and comfort to the pilgrim People of God (Catechism of the Catholic Church, #972). Mel did indeed depict the Catholic Mary and not the Biblical Mary. There is no evidence in the Bible that Jesus looked to Mary for the strength to go on, as is clearly depicted in "The Passion". What the Bible says is quite different; note the all-sufficiency of Jesus Christ. Anyone who understands the Catholic religion knows the Roman Mary not only is INSEPARABLY JOINED WITH CHRIST IN ACCOMPLISHING THE WORK OF MANS REDEMPTION, but she also shares in his resurrection in a unique way. In the movie, instead of "Jesus" saying, "It is finished", he said, "It is accomplished". According to Rome, it was the Eucharist which was accomplished at the cross! * Immediately after the outrageous scourging scene of "Jesus" where the Romans flay every inch of his body (this is not Biblical), they take him to a room where they crown him with thorns (this is Biblical). The Roman soldiers call him the worm-king and King of the worms (This is not Biblical and seems rather anti-Semetic since Jesus was King of the Jews). . (233) Therefore, Mel is casting this "Jesus" as a Pagan, since Sister Emmerich said in her book that pagans embrace the altar! Once again, Mel is telling everyone who knows the writings of Sister Emmerich that Jesus was a rank pagan! * Mels interpretation of Judas betrayal was also inaccurate. In the movie, when they came to arrest Jesus, he asked, Who do you seek? They replied, Jesus of Nazareth. Jesus said, I am he. Then the soldiers grabbed Judas, pushed him towards Jesus, and he kissed him. Judas didnt need to betray Jesus because he already told the soldiers who he was. In the Biblical account Judas betrays Jesus with a kiss and then Jesus asks, Whom seek ye. Let us stay here for just one more minute. The whole purpose of Judas' kiss was identification! The High Priest wanted to ensure that his guards arrested the right man, especially since the arrest was planned to occur in the middle of the night. Therefore, he paid Judas 30 pieces of silver so that, by the betrayal kiss, the guards would know exactly whom to arrest! The movie gets this simple scene exactly wrong, exactly opposite! The power of those words, I am he sent His enemies backward to the ground! Of course Mel did not depict this in his movie. So many people have told us this movie is going to bring about good because it has gotten everyone talking about Jesus! While this is true, which Jesus is being discussed? It cannot be the Biblical Jesus, for He is not being portrayed in this movie. At the very least, the "Jesus" here is a very Traditionalist Catholic "Jesus" whose traditional Roman Catholic role is augmented significantly, drawing from the demonic visions of the mystic, stigmatist, levitating, Sister Anne Emmerich! But, as we demonstrated in NEWS1898, this film presents Antichrist clues so that Adepts throughout the world would realize that the movie, in the final analysis, was presenting Antichrist. This fact is the reason this movie presents the naked buttocks of "Jesus" as the very last scene! This nakedness is the final clue in the Illuminati depiction of "Jesus". Therefore, as the world is hurtling toward the fulfillment of the "Last Birth Pangs" war that will actually produce Antichrist, is it now time to produce a film called "The Passion of the Christ" in which the "Christ" presented is actually Antichrist? People today are buzzing about "Another Gospel" and "Another Jesus", a man we have proven is really Antichrist! Do you really think any good will come of people buzzing about Antichrist? This film is truly another sign that the End of the Age is quickly approaching!